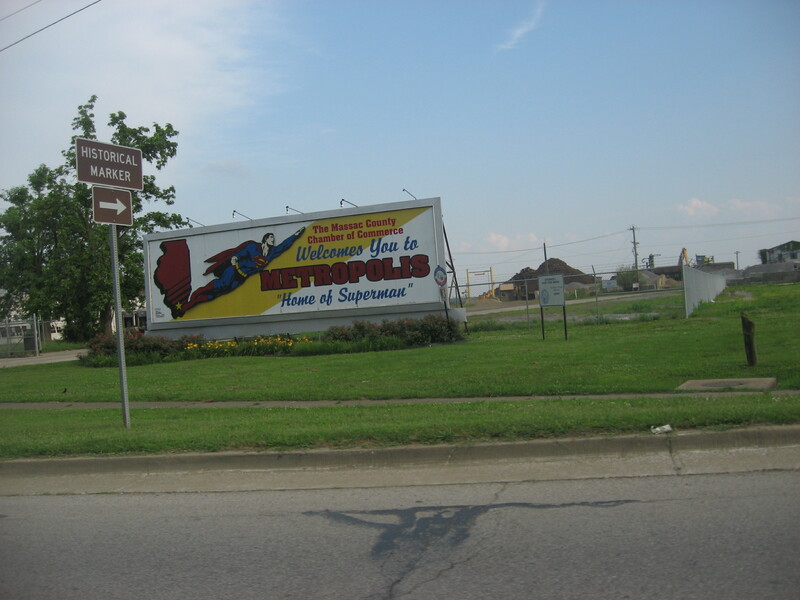 Metropolis, IL is located at the southern tip of Illinois just across the Ohio River from Paducah, Ky. A settlement around Fort Massac, it got its name on April 18, 1839- almost 100 years before the birth of Superman (1938). 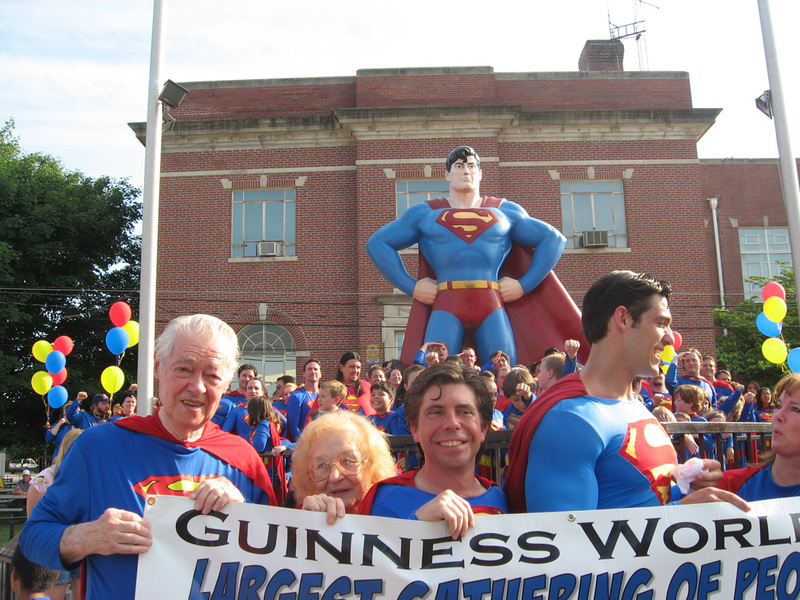 It was proclaimed to be the official home of Superman during a “Superman Day” celebration on January 21, 1972. Mayor J.P. Williams, National Periodical Publications (DC Comics) publisher Carmine Infantino, and ‘Superman’ Rev. Charles Chandler were on hand with over 3000 people to witness the event. The current population of Metropolis is around 6,500 residents. We were all heading north, then west, then north some more, then west again. Louisville is north east of Memphis, so started to get a bit concerned about the direction we were heading in. Dave’s dad Ron was a truck driver so I trusted him and his sense of direction and just figured he knew a good short cut. Then we hit I-24 and were going away from Nashville and Louisville. I asked again if we were going in the right direction and Ron assured me he knew where he was going. Then we all saw the signs saying Metropolis was up ahead! We took the Metropolis exit and headed towards town. It was looking a lot more like Smallville than Metropolis. 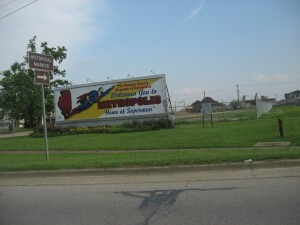 A few hotels, a gas station, some fields, some more fields, a McDonalds, a car lot, a Sonic, and then a big welcome sign as we passed a park and made a right- “The Massac County Chamber of Commerce Welcomes You to Metropolis- ‘Home of Superman’”. I gotta say I geeked as I read the sign and saw the big image of Superman flaying across it. 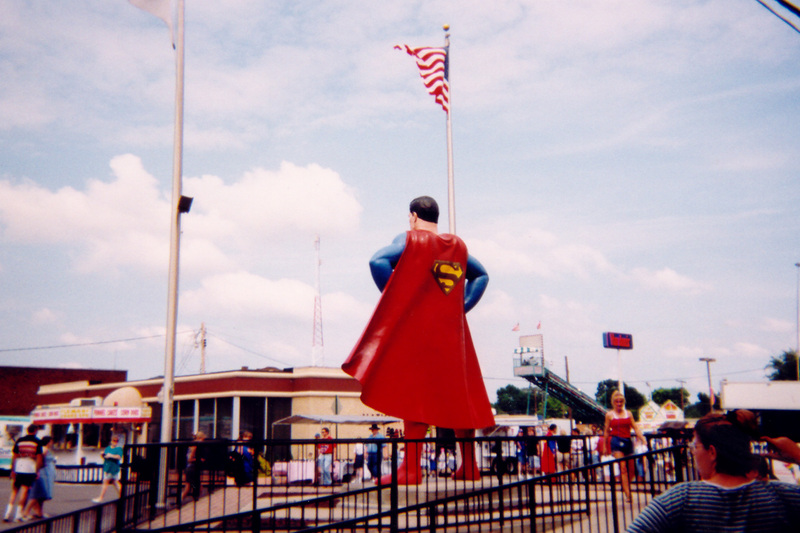 We soon saw a water tower with Superman on it (no longer there), passed The Metropolis Planet– their local weekly newspaper, and then saw a sign that said we were headed toward the “Giant Superman Statue”! We passed the closed Massac Theater (which the city is in the process of fund raising to renovate it) and made a right and parked in front of the Massac County courthouse. 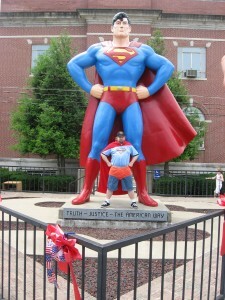 And there in Superman Square was the 15′ tall Superman statue on his \S/ shield base! I’ve always been more of Batman fan than Superman fan, but loved the TV show with George Reeves, the Christopher Reeve movies (yes- I did believe a man could fly! ), and all of the Superman cartoons as a kid. I have to admit, seeing that statue for the first time was one of the coolest things I’d ever seen! I still get a kick out of it every time I see it when I visit Metropolis. Anyone who stands in front of it can’t help but put their hands on their hips and strike a super pose, and that’s exactly what we did- and do every year since. 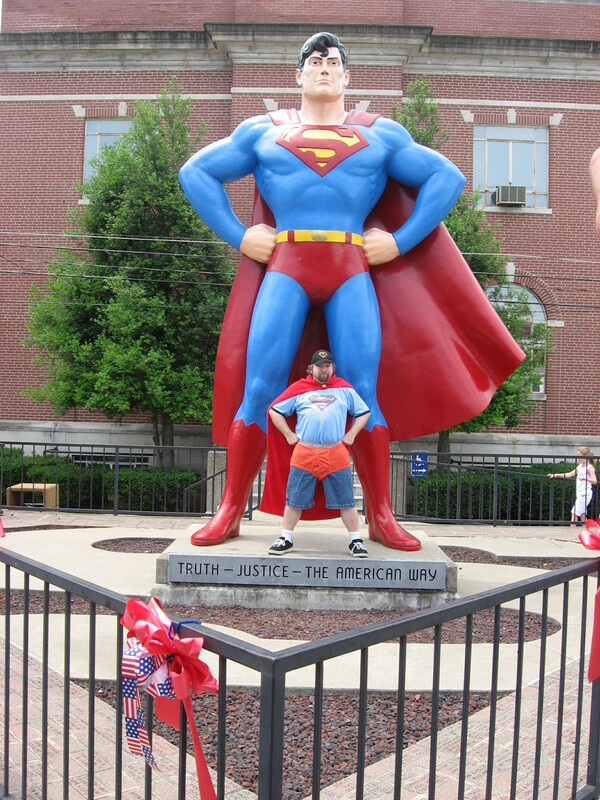 Some of us like to wear our underwear on the outside of our britches, and thankfully it’s not discouraged in Metropolis. We walked across the street to the Supermuseum, but were too late to take a tour. They had closed just a short time before we arrived, as did most of Metropolis it seemed. We did happen to see a poster in the window which said there was a “Superman Celebration” happening there the following weekend. We immediately made plans to make another road trip back to Metropolis! The following Saturday we got up early, piled into Dave’s mom’s van along with his dad, little brother, and with a slight line-up change each year we continued to make a day trip on Saturday for the next few years with more friends. We also tried to hit Lambert’s Cafe (home of the throwed rolls) in Sikeston, MO on the way home each year, and sometimes we get to make two stops! Mmmmm..! But back to that first year. We parked near the courthouse again, checked out the Superman statue, Supermuseum (owned by super-collector Jim Hambrick), bought some souvenirs at the local drugstore/Hallmark shop, and then headed over to the Chamber of Commerce to see what was going on in there while stopping here and there to take pictures of some of the visiting costumed superheroes and villains. There was a short line as we entered (much different from each of the following years), and we saw some folks sitting at tables signing autographs. 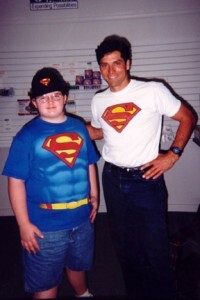 The first person we met was Gerard Christopher– Superboy from the “Adventures of Superboy” TV series. (That’s him above with Dave’s younger brother Ronnie). 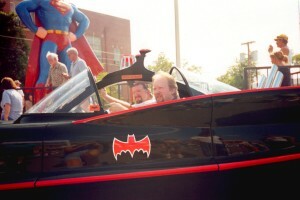 Next to him was comic artist Kerry Gammill (who we had met in Memphis at the 1992 Fantasy Con). We bought some signed photos and art from Gerard and Kerry. Then we moved down to the last table where artist Alex Ross was sitting! We had no idea that Alex would be there and I had none of the comics, art books, or prints of his that I owned with me- and he wasn’t selling anything. Luckily I had bought some Metropolis postcards at the drugstore and had him sign one of those. A few years later at the 2003 Superman Celebration Alex was there hanging out in the park in front of the courthouse with his dog, and again I didn’t know he would be there and had none of his work to get signed, but he was nice enough to sign my sketchbook and pose for a pic with me. That’s another story I’ll have to tell later that involves me losing my nephew while waiting for a Steve “The Dude” Rude sketch at the main tent. 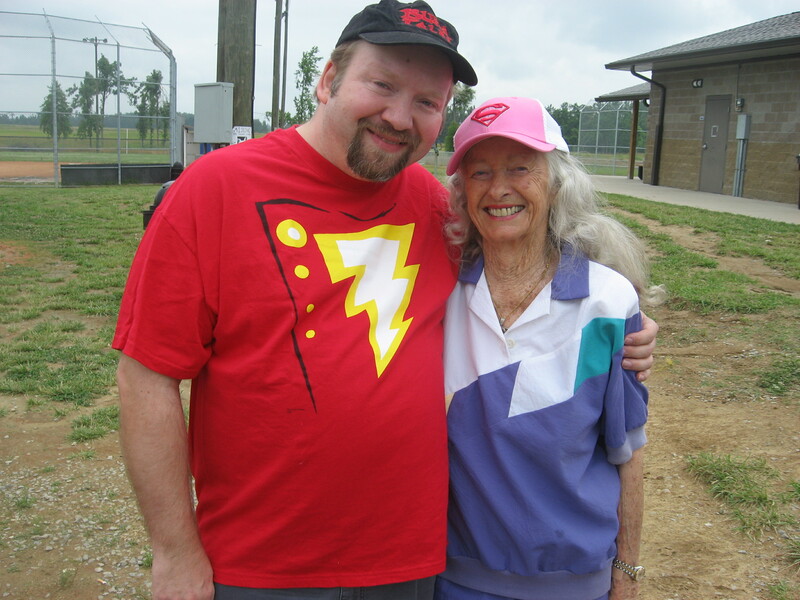 Over the next few years we got to meet celebrities Marc McClure, Margot Kidder, Sarah Douglas, Jack O’Halloran, Jeff East, Valerie Perrine, Bob Holiday, Jackson Bostwick, Adam West, Julie Newmar, Yvonne Craig, Lou Ferrigno, and Noel Neill, as well as comic creators Rick Stasi, Mike Carlin, Jeph Loeb, illustrators Cat Staggs and Steve Stanley, plus our writer buddy and fellow Memphian Eddy Zeno and the official Superman of Metropolis Scott Cranford. Recently they’ve had comic guests Len Wein, Marv Wolfman, Jack Black, Jon Bogdonave, Gail Simone, John Ostrander, Mary Mitchell, Dave Beaty, Mike Norton, Josh Elder, Freddie Williams II, Jamal Igle, Murphy Anderson, Carmine Infantino, and actors Michael Rosenbaum, Stephan Bendar, Helen Slater, Allison Mack, Laura Vandervoot, Sam Witwer, Phil Morris, Justin Hartley, Alaina Huffman, Jerry Maren, Beverly Washburn, Mark Pillow, Tracy Roberts, Ilya Salkind, Sam Huntington, and Brandon Routh. Each year the the crowds at the celebration got bigger and bigger and the lines for the celebrities got longer and longer. In 2005 I was asked to be one of the artist guests. I had run into Steve Stanley again the previous year and he asked if I would be interested. I said, “Uh, sure!” and the rest they say is history! 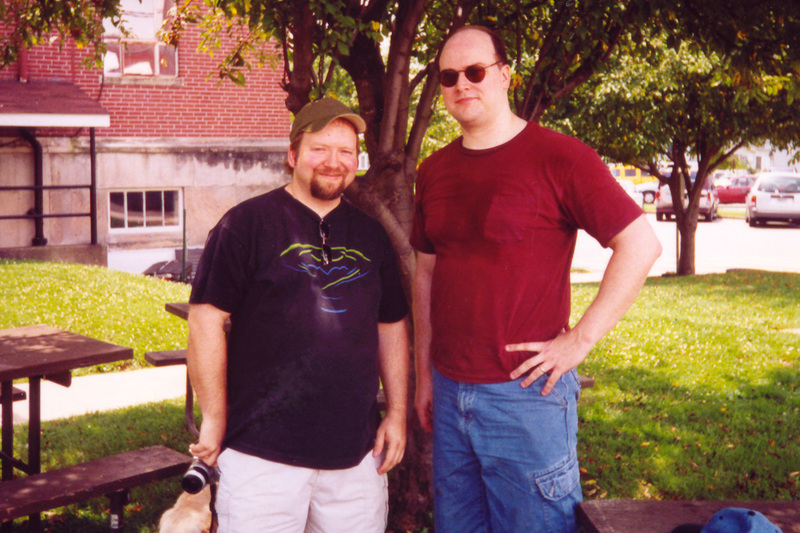 2005 was the first year for an artist alley and we were set up in the Metropolis Community Center just across from the Superman statue and main tent. My friend Kevin Williams had volunteered to help me watch my table and brought along his puppet Muley the Mule to help entertain the families. Steve and I did some art seminars or “our song and dance routine” as I tend to call it. The air conditioning in the community center was amazing and helped create an art oasis in the Metropolis summer heat. Many a costumed visitor came to share some of the cool artist alley air. That year comics writer and editor Mark Waid was the comics guest, Margot Kidder, Noel Neill, and Jon Schneider were the celebrity guests. I was honored to be asked to do press mixers and Q&A panels with them all. Before the Q&A under the main tent, Steve and I thought we were late because we could hear Noel answering questions from across the way from us. We both took off running across the asphalt looking like the dynamic duo- sans capes and theme music! When we got to the back of the tent, Mark Waid was standing there. When we asked Mark why he wasn’t up there yet he said that he was headed over when he heard Noel talking and didn’t want to interrupt. When a break in the questioning stopped and we finished a couple rounds of “You go first!”-“No, you go first!” Mark finally went up the stairs to the stage and sat down, followed by Steve and me. We found out once we got on stage that Noel had arrived early and was just chatting with the crowd until it was time to start. She’s great and the fans love her- which is why she’s known as “the first lady of Metropolis”. A class act! A few minutes later John Schneider arrived, and before he took his place he walked over, shook Noel’s hand, and told her he was a big fan of hers. Another class act. The next year we invited more of the “Memphis Mafia” from the MidSouth Cartoonists Association and the artists alley really started to take shape. 2007 was the first year we did a costumed “block party”. We had noticed a need for more late night entertainment and decided to do a 2 night open house at artists alley with free food, beverages, prizes, art show, and fan films on an outdoor big screen by our friend Tim Brown, who later would help with setting up A/V in the artists alley and starting the annual Superman Celebration Fan Film Awards. Tim’s wife Traci and my future fiancee Nicki came along and really became great guest liaisons and comics ambassadors at artists alley. This was the last year we were in this location, and the last year Scott Cranford was Metropolis’ Superman. Josh Boultinghouse took over the cape duties the following celebration after a nationwide contest. In 2008 we had to move the artists alley down the street a few blocks when Dippin’ Dots bought the community center building, but that didn’t hurt traffic at the “Artists Alley and Writers Way” (its new name). The new Noel Neill/Lois Lane statue erected in 2010 on the next corner up helped get more foot traffic down to our end of Market Street. We also noticed after we started adding more after hours events at the AA/WW that traffic up and down Market Street and around Metropolis continued to grow as well, which in turn encouraged vendors to stay open later. In 2005 the town rolled up the sidewalks around dinner time and now they are busy well after dark, and on Sundays- which were light to say the least some years. Now it is the biggest costuming day with the $1000 costume contest– which continues to get bigger and better. Between the late night events, other daytime events that have been added, and the ones that already existed it’s really become hard to choose what to see and do while in Metropolis! Over the years the crowds have continued to grow, but the town has kept it’s small town charm. It really is more like Smallville than the Metropolis most fans are familiar with, but that’s the magic of Metropolis. You expect to run into the Kents as you walk around town, and sometimes you do! Not all of the residents are what I’d call Superman fans, but the town as a whole has embraced their adopted Kryptonian son, and open their town to fans of his year round. It’s a town I immediately fell in love with and now consider a second hometown. Being from Memphis and an admitted lifelong Elvis fan I tell folks- if you’re a Superman fan and haven’t been to Metropolis, it’s like an Elvis fan who’s never been to Graceland. You have to make the trip at least once in your life. Karla Ogle, Lisa Gower, the Metropolis Chamber of Commerce, Mayor Billy McDaniel, and all of the Superman Celebration volunteers and their families have all become friends of mine, and I look forward to seeing them and my other “super-friends”each year. Even a flood this year couldn’t stop Superman and Metropolis from throwing a great party! 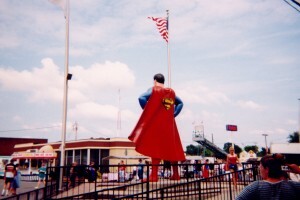 Other Attractions: Giant Superman Statue, Noel Neill/Lois Lane statue, Fort Massac, Harrah’s Casino, Superman Museum, Americana Museum, Bird Man of Alcatraz grave site, Superman water tower, Massac Theater, Chamber of Commerce, “get Kryptonited” at Willy Jak’s.